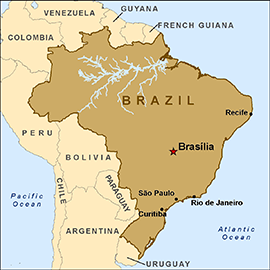 The level of poverty in Brazil is overwhelming in its underdeveloped remote and metropolitan regions; Rreth 9,100,000 children are living in poverty according to the UNICEF child welfare statistics published in 2006. In fact, Brazil’s largest struggle stems from the vast number of orphaned children living on the streets, deprived of proper nutrition, health care, education and safe housing which comes with dire consequence. Drug use is commonplace, crime rates are unimaginable and many of Brazil’s youth turn to prostitution as a means of survival. We began our missions in Brazil when we established the 3rd Community Rehabilitation Center, in Contagem, MG. We have seen great success with this program, however the need for rehabilitation is unfounded and expansion is critical. In addition to our rehabilitation center, we also frequently distribute food, clothing and other essentials to the needy children and underprivileged families living in communities throughout Brazil.